Caster Semenya announces return to athletics this season. Semenya is facing an ongoing investigation into her gender. Semenya has not raced since winning 800m gold in World Championships. (CNN) -- Caster Semenya, the world 800 meters champion facing an investigation into her gender, has announced her intention to return to athletic competition this season. "I am an athlete first and foremost and it is vital for my competitiveness, my well being and for my preparations for events during the European summer that I measure my performance against other athletes," the 19-year-old said in a statement Tuesday. The South African has not raced since claiming the gold medal at the World Championship in Berlin last August. The International Association of Athletics Federations (IAAF) announced earlier this month that the inquiry into Semenya's gender had not been concluded. Semenya stormed to victory in the Olympic Stadium last August, winning the final in one minute 55.45 seconds. 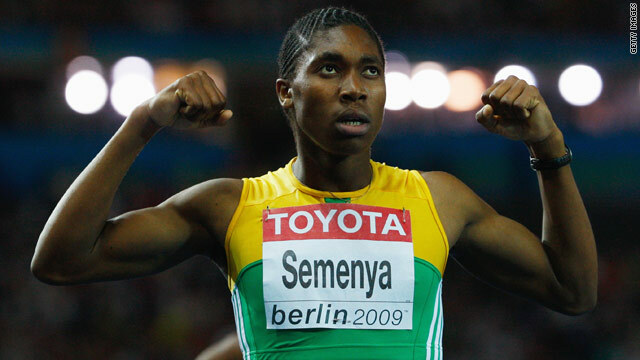 However her victory was overshadowed by revelations that she had been asked to undergo gender tests by the IAAF. In her statement, Semenya criticized the IAAF for taking such a long time over its investigation. "Notwithstanding my reservations about the correctness and moral integrity of the process I underwent prior to, during and after the Berlin World Championships, on the strength of the representation that I had committed no wrongdoing, I begrudgingly committed to assist the IAAF in concluding its processes which I did not agree with," she added. "Given that I have rightfully not been disqualified nor suspended from athletics competitions and given also that I expected these processes to be expedited I, on my own volition, resolved not to compete in athletics competitions until these processes had been completed. "Unfortunately these processes have dragged on for far too long with no reasonable certainty as to their end. The result is that my athletic capabilities and earning potential are being severely compromised." In January, the IAAF announced that Semenya was free to run competitively, only to be contradicted by South African Olympic Committee president Gideon Sam who said she would not be permitted to compete until the IAAF had made its ruling. In November, the South African sports ministry said Semenya was entitled to keep her gold.